Operations can be performed on multiple figures in the frame editing area. This can save a lot of time if you want to move multiple figures by the same amount or apply the same operation to them. Selected figures are displayed with an orange origin handle and red segment handles. Unselected figures are displayed with blue handles. Selecting figures works in a similar way to selecting files in Windows Explorer, with the main difference being that at least one figure must always be selected if figures exist. Normally when clicking a figure without dragging it, that figure will become selected and all other figures will become unselected. However, there are several ways to select multiple figures. Holding down the Shift key while clicking any figure will change that figure between being selected and unselected, without effecting other figures. Dragging a rectangle around multiple figures by holding the mouse down anywhere where there isn't a handle will select any figure whose origin point is within the rectangle. This will not effect any figure outside the rectangle. 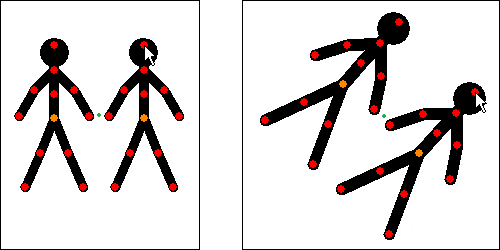 Similarly, figures can be unselected by firstly dragging a rectangle around them and then dragging so that they are no longer inside the rectangle. A group of joined figures can be selected by double clicking the figure at the base of the tree. This can be useful if there are many other figures on the editing canvas. Finally, all figures in the frame can be selected by clicking 'Select All Figures' in the Edit menu or by using the keyboard shortcut Ctrl+A. Once multiple figures have been selected, they can be moved around as if they are a single object. Drag any orange origin handle to move the selected figures or use the arrow keys to move them in 1 pixel increments. Hold down the Alt key on the keyboard and drag any red handle to rotate and scale the selected figures as if they were a single object. The figures will rotate and scale around their common centre. As with single figures, the Ctrl and Shift keys can be used in combination with the Alt key to lock scale and rotation respectively. + Z. The Alt and Z keys used together will lock the separation of the figures so that the position of their centres remains constant. + X. The Alt and X keys used together will lock the scale of figures but allow their separation. Multi-figure rotation and scaling using just the Alt key. The green dot indicates the common centre of the selected figures and does not move. Most of the figure control buttons work with multiple selected figures. The delete, colour and opacity controls work on each selected figure separately. All selected figures will be deleted or set to the chosen colour or opacity. The centre, flip and scale controls treat the selected figures as if they were a single object. The centre button centres the common centre of the selected figures so that they stay in the same position relative to each other. Similarly, the flip button flips the selected figures horizontally about their common centre. The value in the scale control shows only the scale of the first figure that was selected, but when changed all selected figures will change such that their scale's stay fixed relative to each other. The raise and lower buttons send all selected figures behind or in-front of the unselected figures. They will stay in order relative to each other. If Ctrl is held then each figure will be raised or lowered by 1 figure layer. The duplicate button duplicates all figures. The resulting duplicates will have the same position relative to each other and will then be selected. If selected figures are joined using the join tool, then the duplicates will also be joined. If a selected figure is joined to an unselected figure, then its duplicate will be unjoined. The edit and join buttons do not work with multiple selected figures. The join button will be disabled and the edit button will open the figure builder, but only with the first figure that was selected.